My love affair with museums began when I was seven. I saw a bunyip’s head in a glass case, a strange, unsettling creature with a one-eyed blind stare, a cycloptic monster. I was small and I stood up on my toes to see the creature through the glass. On show, the bunyip was mounted in a tall, ornate nineteenth-century wooden cabinet. The typed paper label gave scientific verification: ‘A bunyip’s head, New South Wales. 1841.’ I recall the palpable shock of it, and my mixed childhood emotions: bunyips were real. With its long jawbone wrapped in fawn-coloured fur, it was a decapitated Australian swamp-dweller preserved. Yet, the horrific creature looked so sad, and with its sightless eye, gaping mouth and cartoonish backward drooping ears. It was a creature of pathos—a gormless, goofy redhead, a ranga, a total outsider. Figure 1: The Macleay Museum ‘bunyip’. University of Sydney. Registration number MAMU NHM.4. I never forgot that bunyip, but over the years I became uncertain if I had ever really seen it. Four decades passed, and it appeared one day on a friend’s Facebook page as the Macleay Museum’s colonial ‘bunyip’ head. My childhood beguilement returned to this specimen, a confected creature made from a deformed foal’s skull and skin. Yes, the bunyip’s head was a fraud, a clever admixture of fur, horse-bone and plaster. This creature was made real and placed on display in the 1970s museum as both curio and mythic monument, one that taps powerfully into the Australian colonial imagination. 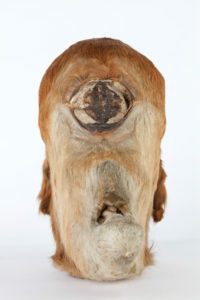 Yet this thing, a foal’s head fraudulently mounted and made as specimen, is both animal and something more than animal. Like Rosa Praed’s bunyip it is an object that is real and unreal, familiar and unfamiliar, horse and phantasm, it is a creature that performs the uncanny rupture of the Anthropocene. Figure 2: The Macleay Museum ‘bunyip’. University of Sydney. Registration number MAMU NHM.4. In this article, I read the Macleay bunyip head as an uncanny object constituted through the unruly material exchanges of the nineteenth-century Anthropocene. In Australia, widespread ecological displacement and change was precipitated by the historical processes of colonialism, with its roots in the 1492 Columbian exchange and the violent invasion of the new world (Lewis and Maslin; Mitchell). The Columbian exchange has been conceived of as a critical turning point in the Earth’s history because it performed a ‘swift, ongoing radical reorganization of life on Earth without geological precedent’ (174), which eventually came to produce the ‘unprecedented homogenization of Earth’s biota’ (175). As many scholars have now begun to argue, the Anthropocene has not been devoid of imperialising forces. The Anthropocene could not have occurred without the contribution of European exploitation of people and environments, where colonialism ‘universalized notions of nature as a commodity for human exploitation while creating a global economy that systematically subordinated the global South’ (Gonzales, 4, 5). Pastoralism, mining, logging and cash-crop systems have dispossessed local communities, destroyed water systems and forests, and radically shifted the ecosystems of the colonised territories (Miles). In the rapid exchange of biota and its great consequence for Indigenous worlds, we must see the ‘important connections between European colonisation and the current mass extinction event’ part of the ‘tendency of colonial violence to resonate across species boundaries’, remarks Audra Mitchell. (Mitchell). The Macleay Museum ‘bunyip’ can be traced back to an era of colonial expansion in southeastern Australia that violently displaced Aboriginal peoples and wrought rapid, widespread change to local biosystems. It therefore takes us to the unsettling antipodean Anthropocene, to the midst of invasion of Aboriginal worlds concurrent with the importation and acclimatisation of new species in the name of perfection. Here, colonists brought in new animals and rearranged biota, disordering landscape, environment, and animal and human bodies. The bunyip thus, as I will show, takes us to the violence of settler colonialism and its restless, productive energy, with its ever ‘vanishing endpoint’ (Strakosch and Macoun). As Aboriginal people were rapidly removed and dispossessed of their lands, the Macleay bunyip emerged as a confounding mythical figure: it was made from the bones of a colonial import—the horse of European invasion and pastoralism—but was mistakenly thought to be native and ancient. In the 1840s scientific men in southeastern Australia took this confected bunyip specimen as a serious object of enquiry and hypothesised that it may have been a living prehistoric relic, in a period which saw the first scientific discoveries of megafaunal fossils. In this article, I attend to the Macleay Museum bunyip and its momentary entanglements with other species, fabulous or real, at a critical time in the nineteenth century when settler colonialism and colonial science gave rise to both an antiquarianism, a probing of deep time, and a new Australian environmental imagination. I look to the ‘material vibrancy’, in Jane Bennett’s words, of this strange assemblage of horse and hoax and seek to explore its emergence within a ‘political ecology of things’. The Macleay bunyip, confused as a deep-time megafaunal creature, or a living Gothic throwback, became native and yet horrendous. Moreover, as I will explore, its uncanny nature resides in something more. Taking as my cue Christopher Pinney’s notion of objects ‘as densely compressed performances unfolding in unpredictable ways and characterised by what … look like disjunctions’ (269), I interpret the Macleay bunyip head as an ambivalent object that crosses frontiers and confounds time and place, a multitemporal and biopolitical artefact of invasion. The bunyip head performs the confusion of the Anthropocene, and thus choreographs a kind of ‘bunyip time’; it is an object that in its curious unfolding marks the rupture and turmoil of the Anthropocene in the Antipodes. By the mid-nineteenth century, the figure of the bunyip drawn by Europeans from Aboriginal traditional stories had become popularised, and by the close of the century the opening line of Australian author Rosa Praed’s 1891 short story ‘The Bunyip’ read: ‘Everyone who has lived in Australian has heard of the Bunyip. It is the one respectable flesh-curdling horror of which Australia can boast. The old world had her tales of ghoul and vampire, or Lorelei, spook and pixie, but Australia has nothing but her bunyip’ (318). Literary studies scholar Ken Gelder and others have read the bunyip’s swampy meanderings through Australian literature via the lens of the mythic, the Australian postcolonial gothic, and also through Freudian psychoanalysis. While the bunyip is said to come from Aboriginal myth as a water dwelling monster, for Europeans it has come to stand in for the melancholy of the Australian bush and the unspoken spectre of the violent dispossession of Aboriginal peoples. Praed’s bunyip, observes Christa Knellwolf, is linked to the art of white settler national myth-making, a vehicle for settler social cohesion in a place seemingly without history, heritage or ghosts. Thus, the dreadful bunyip is ‘qualified as the only genuine Australian spirit’, one that became a ‘stock character of Australian mythology’ (113). And, it stood for something more than animal. As Gelder surmised on the suppression of and lateral forms of sublimation of colonial violence, the ‘Australian bush, Aborigines, and monstrosity, through a uniquely Australian creature, the bunyip, are yoked together under the exaggerated sign of the gothic’ (19). Yet, in the early 1840s, over half a century before this Australian creature that lurked in waterholes had reached it mythical and literary apogee in the age of Federation, members of the Royal Society of Tasmania sought to examine such an animal. At this time, two ‘bunyip’ specimens came to fascinate the scientific circles of colonial New South Wales, Port Phillip and Van Diemen’s Land (Tasmania). The Macleay Museum bunyip, the cycloptic foal’s head prepared with taxidermy, was first found at the Hawkesbury River in 1841 and later sent to the RST in Hobart, Van Diemen’s Land, for special examination. Five years later, a second head was found by the Murrumbidgee River by squatter Athol T. Fletcher. The Murrumbidgee skull was famously displayed at the Colonial Museum of Sydney the following year as a possible bunyip specimen (it has since become lost). At the time, this specimen was declared by scientists to be from a strange and unknown species. But when the skull was exhibited, the naturalist William Sharp Macleay revealed that he had surveyed the specimen in question and found that it bore a similarity to a skull found in 1841 in the Hawkesbury River that he had in his possession. In an article for the Sydney Morning Herald ‘On the Skull Now Exhibited at the Colonial Museum of Sydney’, he explained that the skull currently on display (from the Murrumbidgee River) was similar to an earlier skull (from the Hawkesbury), and in fact it was likewise the misshapen foetus of a mare. From the late eighteenth century, the new colonies in Australia and New Zealand were sites for the strangest of new creatures, at least to European eyes, and amateur scientists in the pursuit of natural history sought to scrutinise and delineate what was known and what unknowable of the southern biota. In the Antipodes, Europeans found curious living species and, simultaneously, began to exhume the bones of fossils, including large megafauna. 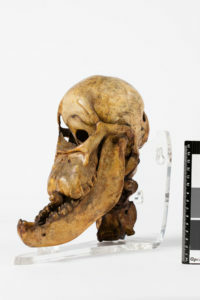 The Hawkesbury bunyip skull, which had been sent to the Royal Society of Tasmania for examination, became the subject of serious discussion as they speculated on the veracity of the specimen. Members of the Society exhibited and discussed new creatures of scientific curiosity such as black swans, wombats, and thylacines (Tasmanian tigers). The members responded enthusiastically to the requests from Europe’s elite scientists to send specimens from the colonies. Society Minutes show member Ronald C. Gunn ‘expressed his hopes that some of the members would aid him in procuring these desiderata’ for the eminent British comparative anatomist and fossil hunter Professor Richard Owen, who sought out animals such as an ‘impregnated Platypus or Echidna preserved in spirits’ and ‘the brains of the Thylacinus and Dasyurus (Tasmanian Devil)’. At the same time, they deliberated the possible existence of the mysterious water-dwelling quadruped, the bunyip: was it real and living, and could it be a vestige of some large antediluvian creature? In the 1830s and 1840s, itinerant scientists in southeastern Australia sought to assay the geological history of the vast Australian continent, and speculation increased on the existence of an early race of animals in Australia, possibly antediluvian (existing before the biblical Flood). In 1830 Major Thomas Mitchell, Surveyor-General of New South Wales and member of the British Geological Society, explored the Wellington caves, on Wiradjuri land, near present-day Dubbo, and found there the bones of Diprotodon, a species of megafauna. In the Australian colonies in 1824 Mitchell had met the Rev. W. Buckland, who had published an influential treatise attributing the presence of large animal bones in Australian caves to the Great Flood. Mitchell became interested in seeking out bones in Australian caves and, in November 1829, he explored the Grill Cave at Bungonia, seeking out antediluvian remains (Dunkley 6). Later, Mitchell wrote: ‘I had long been anxious to extend my researches for fossil bones among these caves, having discovered… that many interesting remains of the early race of animals in Australia were to be found in the deep crevices and caverns of the limestone rock’. Newspapers announced the fossil finds, and Mitchell knew that besides occasioning great interest in London, such antipodean discoveries also threatened to shift the order of presumed knowledge (Dunkley). The mysterious bones were shipped to England for description by Richard Owen, who first coined the term ‘dino-saur’ and was later one of the forces behind the creation of the Natural History Museum in London. Owen published a series of papers on the extinct mammals of Australia and, aided by colonial informants, would claim to ‘discover’ Diprotodon (1838) and later Thylacoleo, the giant marsupial lion (1859), as well as gigantic extinct kangaroos and wombats (Johnson). Later, German amateur scientist Ludwig Leichhardt also located fossils and sent them to Owen for examination in London. Leichhardt, too, was captured by the idea of ancient giant animals and speculated that some might continue to exist: ‘It seems there was a time when gigantic Kangaroos of the size of a bullock or of a rhinoseos [sic] gambolled over the downs and who knows whether such strange things do not still exist in the tropical interior’ (Leichhardt). Figure 3: From William Hovell, ‘The Apocryphal Animal of the Interior of New South Wales’, Sydney Morning Herald 9 February 1847. The newly discovered bunyip specimens seemingly emerged out of time and place; they were grotesque variations confounding orderly systems of human knowledge and taxonomies. 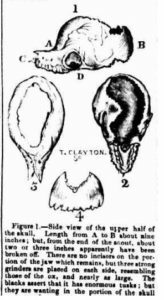 On 7 July 1847 Macleay published an article in the Sydney Morning Herald debunking the belief that the skull exhibited at the Colonial Museum of Sydney (now the Australian Museum) was that of ‘the bunyip’. Macleay had examined the skull in question and sought to end debates once and for all, reporting that the strange head was a foal’s skull, and not a water-dwelling creature at all, noting emphatically that ‘nature does not make jumps’ (Natura non facit saltus). In so doing, he expressed the idea that natural things and properties change gradually, rather than suddenly, a theory given definitive expression in Linnaeus’s Philosophia Botanica, thus drawing the strange head back within orderly Linnaean systems. Despite Macleay’s finding, two years later Ronald C. Gunn in Van Diemen’s Land, lagging behind scientific speculation, would declare hopefully in his own scientific article ‘On the Bunyip of Australia Felix’ that ‘every effort is now making to obtain an entire living Bunyip or ascertain whether it be classed among the fabulous animals’ (Gunn). Figure 4: The Macleay Museum ‘bunyip’. University of Sydney. Registration number MAMU NHM.4. Just as Gunn sought out the fabulous bunyip, he traded in Tasmanian thylacines and other extraordinary antipodean animals. He also actively sought out Tasmanian Aboriginal human remains to traffic with men of science in Britain, along with his prominent Royal Society of Tasmania colleagues Joseph Milligan, the superintendent of the Flinders Island and Oyster Cove settlements, where Aboriginal people had been sequestered, as well as Hobart surgeon William Crowther, and lawyer Morton Allport. These men played lead roles in the nefarious trade of Aboriginal human remains, during and after the genocidal ‘Black War’ propelled by settler land-grabbing (Ryan; Turnbull). Objects and specimens as well as the human remains of Aboriginal peoples from newly colonised worlds moved in circuits of trade and scientific prestige between individuals and institutions, and the colonies and the metropole. Macleay’s insistence that ‘nature does not make jumps’ stands at odds with the profound biopolitical reordering rendered by settler colonialism and the anthropocenic shifts taking place at this time. The colonial scientific concern with deep-time antiquity and great megafaunal creatures of the Pleistocene sits painfully at odds with the apparent lack of concern for living Aboriginal peoples amid speculations of their origins, now known to be at least 50,000 years and more in the past. The twin concerns of antiquity and dispossession sit within the context of settler land-taking and the sudden rupture and radical rearrangement of intimately linked Aboriginal worlds. Aboriginal peoples, weakened by the introduction of diseases, waves of settler violence, and simultaneously overrun with the animals of pastoralism, the sheep, the cow, and the horse, likened this to a catastrophe (Banivanua Mar and Edmonds). In the name of acclimatisation, new and alien species were brought into the Australian colonies, marking a massive reorganisation of the native biological landscape, rending the human–animal relations of the Indigenous world. Many of the scientific men of the Royal Society of Tasmania, such as Allport, would become members of the Tasmanian Acclimatisation Society, established in 1862. The society called for ‘the introduction, acclimatization, and domestication of innocuous quadrupeds, birds, fishes, insects and vegetables, whether useful or ornamental … [and] the perfection, propagation, and hybridization of the races introduced or already domesticated’. Just as the Royal Society investigated the ‘moles [that] lay eggs and have ducks’ bills’ and the strange skull of a bunyip, the Tasmanian Acclimatisation Society imported, on a massive scale, salmon, trout and the many ‘innocuous quadrupeds’ that encroached on the lands not only of the fabulous bunyips, but also of the soon-to-become-mythic thylacines (Tasmanian Royal Society). It is to this dense, violent and fast-moving ‘political ecology of things’ in the mid-nineteenth century that we must look. The Anthropocene ‘marks severe discontinuities; what comes after will not be like what came before’, write Donna Haraway and Jason Moore in their assaying of the collision of capitalism, modernity and colonialism (160). The introduction and acclimatisation of European species to the colonies has long been deemed a form of ecological imperialism (Crosby) It is at this moment in the mid-nineteenth century that the rapid reorganisation of species and environment in southeastern Australia began to accelerate. This, then was ‘bunyip time’. By bunyip time, I gesture toward an understanding of time that is biopolitical, refractive and ambivalent. In the 1840s the ‘bunyip’ skull was treated as a serious object of antiquity by scientific men. Yet the monster that these amateur scientists sought to investigate was in fact a creature of their own making: it was the horse of settlement and pastoralism. The bunyip appeared at the same time that naturalists were unearthing megafauna and speculating on living curiosities of the antipodean world, and concurrent with the violent dispossession and anatomisation of the bodily remains of Aboriginal peoples, and the rapid global importation of new species for the reordering and perfection of the landscape. The bunyip’s head can be thought of as both an emblem and performance of a new settler-driven ecological imaginary, an uncanny multi-directional time, in which Australia’s prehistoric past was literally constructed from, and refracted through, the animal material (horse) of the invasive colonial present, one that was wilfully biopolitical and destructive of Aboriginal worlds. Indigenous and anti-colonial activists and scholars have begun to insist that colonial violence and its deep genealogies must be relocated within the Anthropocene. Despite the ongoing talk of the ‘the human’ by natural and social scientists, the human has never been constitutively ‘one’ (Chakrabarty), nor is anthropocenic violence ever evenly dispersed, and we must therefore attend closely to the question of who is the ‘we’ when we speak of ‘the human’ (Hecht). As Gabrielle Hecht writes, the ‘Anthropocene feels different depending on where you are’ and acknowledges that both ‘responsibility and vulnerability are unevenly distributed’. Hecht’s injunction reminds us that the Anthropocene must be located within the specificity of place and time, and cannot be understood as outside or in any way disconnected from imperialism, and nor is it evacuated of the racial order. The Anthropocene and its deep entwining with colonisation have disordered worlds, and led to cascading mass extinctions, in a process that has made the familiar unfamiliar, and thus unhomely, out of place and confounding regular orders of time. In this way, Homi Bhabha’s concept of the ‘unhomely’ is apposite for it foregrounds the discomforting tensions of the civilising domestic world of colonial Australia, where land-taking, rapid settlement and pastoral and biota reorganisation remade Indigenous spaces into either ‘arable’ or ‘waste’ land, and where industrial processes in nominally postcolonial settler states continue to exploit ‘cheap nature’ (Moore), with unevenly violent and profound bodily effects. As Freud described it, the ‘unhomely’ (unheimlich), or ‘uncanny’, is the becoming alien of the familiar through the process of repression (241). It refers to the ‘estranged sense of encountering something familiar yet threatening which lies within the bounds of the intimate’. The ‘unhomely’ is that which ‘ought to have remained secret and hidden but has come to light’; the uneasy feeling arises when that which is concealed interrupts what is ‘familiar and agreeable’ (224-25) Here, feelings of familiarity and safety simultaneously rely on the repression of the violent and thoroughgoing means by which the Anthropocene has remade the planet. The Macleay bunyip head is a horsey remnant of the messy overlap between Indigenous and European timelines framed and directed by the Anthropocene. It is thus hybrid and multi-timed: a thing out of time (located between prehistory and the colonial introduction of new species) and out of place (dislocated from Indigenous stories and confounding Linnaean taxonomy), the bunyip skull is a jarring and disruptive object. As Pinney tells us ‘there are cataracts of objects never fully assimilable to any “context”. Instead of a context that can be sliced sideways (either traversely under the rubric of “culture” or horizontally under the rubric of a contemporaneous “history”), it may be more appropriate to envisage images and objects as densely compressed performances unfolding in unpredictable ways and characterized by what (from the perspective of an aspirant context) look like disjunctions’ (269). The Macleay bunyip head hovers between and confounds contexts and orders of time, real and unreal, familiar and unfamiliar, animal and phantasm, history and culture, it is a densely packed performance of the Anthropocene. But the Macleay bunyip head is also a vibrant material object that has been literally embedded in the landscape, plucked from the mud and the currents of the Hawkesbury River, the watery frontier and a conduit of European invasion deep into Dharug lands. 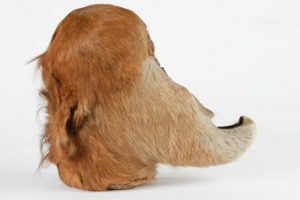 It is not just a product of human myth-making, but the red-furred, deformed cranial remains of a foetal horse, unearthed by a curious squatter. We must take into account its material horseness and its species difference with its heritage from across the sea, and as a (biological) technology of settler colonialism. Thus to mediate on the ‘onto-story’, to use Jane Bennett’s term, of the Macleay bunyip, is to understand the horse as a nonhuman agent that participated in the creation of new—and violent—relationships between humans, land, animals and biosystems. Ontological thinking allows us to appreciate the emergence of new human–animal relations in the antipodean Anthropocene, which took place through species circulation and flows, radically shifting landscapes, and Indigenous systems of cultural adaptation. Bennett’s arresting work Vibrant Matter invites us to consider the ‘political ecology of things’ and their palpable material vibrancy, their productive energy. As much as we are locked into a circular relationship with the human experience of things, Bennett’s injunction urges us is to attend to things themselves, to the ‘vital materiality’ that runs through and across bodies, both human and nonhuman’. She alerts us to the immediate and palpable, productive vibrancy of things, the process and politics of looking at the natural and material worlds, and their agentic force. To do so is to feel the imminent ‘shimmering’ energy of ‘vibrant matter’, in the search to ‘shift… focus from the human experience of things to things themselves’ (Bennett). The horse was an integral part of the inauguration of new worlds and central to the violent ecological displacement of Australia’s colonial Anthropocene. While the bullock and the plough have been ubiquitous symbols of settler colonialism in the new world, associated with bucolic ideas of ploughing and planting in North America and the stadial accomplishments of European settler invasion, in Australia, it is the horse (perhaps more than the sheep) that is the agent of violent colonisation par excellence. Along with the sheep and cattle, potent emblems of pastoralism in Australia, the horse speaks of transportation, travel and invasion. On the eastern beaches of what is now Sydney, the Dharug people first encountered European horses in January 1788, when the First Fleet arrived on their shores. A stallion, four mares, a colt and a filly were loaded out of the ships and had been purchased on a voyage in Cape Town (Dobbie). The horse, I imagine, would have been a curious and frightening animal to Aboriginal eyes. At this early time, Patyegarang, a young Dharug woman aged about fifteen, who was Lieutenant William Dawes’s key language teacher, recounted that her people had given the name ‘Wen-you-a’ to the new giant horse-creature that they saw. Other Dharug words reveal the nature of contact relations: the musket was ‘Dje-ra-bar, Je-rab-ber’, the telescope ‘Gnan-gnyelle’, the edge of a sword ‘Karabúl’. In the new colonies, horses adapted quickly to conditions and their numbers increased rapidly. Between 1830 and 1850 horse numbers rose from an estimated 14,000 to 160,000 largely by natural increase and by the 1860s were identified as feral pests in Australia (Dobbie). On another night they ‘move at a slow pace, shake their heads in imitation of the horse, then stop and imitate the horse feeding, then move on, then lay down with their backs to the fire; this they repeat’ (Plomley). The horse dance then, to speculate, may be read as a ritualised and embodied transcendence over the horse, the symbol of colonial violence and invasion, where the dancer both outruns and becomes the horse, in a new human-animal relationship. Through such a dance, the horse could be pacified, as the men enacted the horses’ feeding, then lying ‘down with their backs to the fire’. This new quadruped was never an innocuous animal. It was used extensively in violent land wars, in official acts of Aboriginal pacification and ‘dispersal’ and the massacre of Aboriginal people. The New South Wales Mounted Police were formed in the 1820s specifically as mounted infantry to quell Aboriginal resistance, and engaged in extensive operations in the Hunter Valley. Later, mounted police corps were established in all other colonies. The now well known images of the Myall Creek massacre of New South Wales (1838) by artist Fizz show stockmen on horseback corralling frightened, chained Aboriginal men, women and children. The horse was deeply entangled in Aboriginal-settler relations, an instrument of invasion, auguring a new political ecology of things. In this way, the horse entered into and transformed Indigenous culture just as the bunyip had moved into settler consciousness. Today, the horse is fully transplanted as the wild ‘native’ Brumby of the Australian bush, giving rise to a fresh set of ecological and narrative consequences. The highest numbers of wild horses in the world reside in Australia, and the species has become deeply controversial. The large, hard hoofs of the Brumbies damage delicate soils and plant life in sub-alpine environments, locales that evolved without similar species. In the Australian Alps, damage includes extensive track formation, soil compaction, changes in the structures of the vegetation, and extensive streambank erosion. The Brumby is Australia’s enduring colonial and mythic emblem of rugged settlement, of bush craft, and of masculine pastoralist endurance in the face of harsh environments. The Brumby performs a historicising and narrative service, it enacts a heroic mythology of white settler Australia, teleology of an always-settled-land, and thereby eradicates Aboriginal deep time and presence, native creatures, as well as the elusive bunyip. In the 1830s and 1840s, the bunyip, a fleeting fictive creature, hovered at the borders of mythic and endangered: a shy, shady billabong dweller. But it also marked a temporal and spatial rupture. The European invasion of a new world brought massive biota exchange and dispossessed of Indigenous peoples of their lands and heritage, and dismantled intimate connections with native species. The Macleay bunyip, a clever hybrid, is something more than animal. It stands at the breaking point between deep time and that which colonials constructed as ‘human’ through their raced concept of civilisation, which both drove and justified the exploitation of people, animals and earthly resources. The Macleay bunyip performs the confusion of the Anthropocene, and choreographs a kind of ‘bunyip time’; it is an object that in its curious unfolding marks the rupture and turmoil of the Anthropocene in the Antipodes. The strange monster that I saw through the glass as a child, rendered from the material of the European horse, continues to disconcert me. It is an ever-unfolding, colonial assemblage that performs the Anthropocene with its rapid and uneven disordering/reordering of species, humans, and environment. With its cycloptic eye the bunyip-horse looks out at the still colonising Anthropocene and its ever-vanishing endpoint. Penny Edmonds is Associate Professor of History and a recent ARC Future Fellow (2012-2017) in the School of Humanities, University of Tasmania. Her research interests include colonial/postcolonial histories, humanitarianism and human rights, Australian and Pacific-region transnational histories, performance, museums and visual culture. Her most recent book Settler Colonialism and (Re)conciliation: Frontier Violence, Affective Performances, and Imaginative Refoundings (Palgrave, 2016) was shortlisted for the 2017 Ernest Scott Prize. A ‘ranga’ is Australian slang for a red headed person, once pejorative, but now also used in the positive. The term was entered into the Australian Oxford Dictionary in 2012. Thanks to Lynette Russell for re-acquainting me with this object, known as the Macleay Museum ‘bunyip’ (The Macleay Museum, Sydney University, Registration number MAMU NHM.45). Thanks also to Jude Philp, Senior Curator, The Macleay Museum, University of Sydney. I also wish to thank especially Camille Nurka, for our conversations on the bunyip, and Katrina Schlunke of the Experimental Histories group, University of Tasmania, for their great discussions on this paper. I would like to thank Katrina Schlunke for her wonderful idea of ‘bunyip time’. The Latin translation comes from Linnaeus’s Philosophia Botanica. ‘The Uncanny/Unhomely in Bhabha’s “The World and the Home”’, The Cultural Reader 27 March 2014, http://culturalstudiesnow.blogspot.com.au/2014/03/the-uncannyunhomely-in-bhabhas-home-and.html. Thank you to Camille Nurka and our discussion on the ‘onto-story’. The Aboriginal peoples of the Sydney region are the Dharug (variant spellings of this name are ‘Dharuk’ and ‘Darug’). The Aboriginal people encountered by Dawes used the term ‘Eeōra’ to describe themselves, but this was a term by which they referred to themselves as people, not the name of their language. See William Dawes, ‘The Aboriginal Language of Sydney’, http://www.williamdawes.org/sydneylanguage.html, accessed 16 May 2018. ‘225 Years of the Horse in Australia.’ The Perth Mint Australia Coin Collector Blog 3 September 2013 <http://blog.perthmint.com.au/2013/09/03/225-years-of-the-horse-in-australia/>. 16 May 2018. Adams, Michael. ‘The Cultural Meanings of Wild Horses.’ The Conversation. <https://theconversation.com/friday-essay-the-cultural-meanings-of-wild-horses-84198>. 16 May 2018. Banivanua Mar, Tracey, and Penelope Edmonds. ‘Indigenous and Settler Relations.’ The Cambridge History of Australia. Cambridge: Cambridge UP, 2013. Bennett, Jane, Vibrant Matter: A Political Ecology of Things. Durham, NC: Duke UP, 2010. Bhabha, Homi K. ‘The World and the Home.’ Social Text 31/32 (1992): 141-53. Crosby, Alfred W. ‘Ecological Imperialism.’ The Post-Colonial Studies Reader. Ed. Bill Ashcroft, Gareth Griffiths and Helen Tiffin. London: Routledge, 1995. 418-22. Dawes, William. ‘The Aboriginal Language of Sydney.’ <http://www. Dawson, James. The Australian Aborigines: The Languages and Customs of Several Tribes in the Western District of Victoria, Australia. Melbourne: Robertson, 1881. Dobbie, W.R., D. McK. Berman and M.L. Braysher. Managing Vertebrate Pests: Feral Horses. Australian Government Publishing Service, Canberra, 1993. Dunkley, John. ‘John Henderson, Thomas Mitchell and the First Publications on Cave Science in Australia.’ Journal and Proceedings of the Royal Society of New South Wales Vol. 142 (2009): 5-15. Freud, Sigmund. ‘The “Uncanny.”’ The Standard Edition of the Complete Psychological Works of Sigmund Freud, Vol. 17. Trans. James Strachey. London: Vintage, 1958. Gelder, Ken. ‘Australian Gothic.’ The Routledge Companion to Gothic. Ed. Catherine Spooner and Emma McEvoy. Abington: Routledge, 2007. 115-22. Gonzales, Carmen G. ‘Global Justice in the Anthropocene.’ Environmental Law and Governance for the Anthropocene. Ed. Louis Kotzé. Oxford: Hart Publishing, 2017. Gunn, Ronald C. ‘On the “Bunyip” of Australia Felix.’ Tasmanian Journal of Natural Science 3 (1849): 147-49. Haraway, Donna and Jason Jason, ‘Anthropocene, Capitalocene, Plantationocene, Chthulucene: Making Kin.’ Environmental Humanities 6 (2015): 159-65. Hovell, William H. ‘The Apocryphal Animal of the Interior of New South Wales.’ Sydney Morning Herald. 9 February 1847. Gabrielle, Hecht. ‘The African Anthropocene.’ Aeon 6 (February 2018). <https://aeon.co/essays/if-we-talk-about-hurting-our-planet-who-exactly-is-the-we?platform=hootsuite>. 16 May 2018. Johnson, Chris. Australia’s Mammal Extinctions: A 50,000 year history. Cambridge: Cambridge UP, 2006. Knellwolf, Christa. ‘Settler Colonialism and the Formation of Australian National Identity: Praed’s “Bunyip” and Pedley’s “Dot and the Kangaroo.”’ Imagined Australia: Reflections Around the Reciprocal Construction of Identity Between Australia and Europe. Ed. Renata Summo O’Connell. Zürich: Peter Lang, 2009, 107-122. Leichhardt, Ludwig to John Archer. 14 May 1844. <http://www.leichhardt.qm.qld.gov.au/The+Exhibition/Sydney+to+Moreton+Bay/Leichhardt+meets+the+megafauna#.WuaoyGXkP-Y>. Lewis, Simon A. and Mark A. Maslin. ‘Defining the Anthropocene.’ Nature 519 (12 March 2015): 171-80. Macleay, Alexander. ‘On the Skull Now Exhibited at the Colonial Museum of Sydney.’ Sydney Morning Herald 7 July 1847. Miles, Kate. ‘International Investment Law: Origins, Imperialism and Conceptualizing the Environment.’ Colorado Journal of International Environmental Law and Policy 21.1 (2010): 21-22. Mitchell, Audra. ‘Decolonising the Anthropocene.’ <https://worldlyir.wordpress. Moore, Jason W. ‘The Rise of Cheap Nature.’ Anthropocene or Capitalocine? Ed. Jason W. Moore, Oakland, CA: PM Press, 2016. 78-115. Pinney, Christopher. ‘Things Happen: Or, From Which Moment Does that Object Come?’ Materiality. Ed. Daniel Miller. Durham: Duke UP, 2005. 256-72. Plomley, N. J. B., ed. Friendly Mission: The Tasmanian Journals and Paper of George Augustus Robinson 1829-1834. 2nd edition. Hobart: Quintus, 2008. Praed, Campbell [Rosa], Mrs. ‘The Bunyip.’ Coo-ee: Tales of Australian Life by Australian Ladies. Ed. Mrs Pratchett Martin. London: Griffith Farran Okeden and Welsh, 1891. ‘Rules and Objects of the Tasmanian Acclimatisation Society.’ <https://nla.gov.au/nla.obj-489136600/view?partId=nla.obj-489184004#>. 16 May 2018. Russell, Penny. ‘“Unhomely Moments”: Civilising Domestic Worlds in Colonial Australia.’ The History of the Family 14.4 (2012): 327-39. Ryan, Lyndall, Tasmanian Aborigines: A History Since 1803. Sydney: Allen and Unwin, 2012. Strakosch, Elizabeth and Alissa Macoun. ‘The Vanishing End Point of Settler Colonialism.’ Arena 37/38 (2012): 40-62. Tasmanian Royal Society. Minutes, 2 September 1847. Turnbull, Paul. ‘Scientific Theft of Remains in Colonial Australia.’ Australian Indigenous Law Review 11.1 (2007). <http://www.austlii.edu.au/au/journals/AUIndigLawRw/2007/7.html>. 18 May 2018. ‘Wonderful Discovery of a New Animal.’ Geelong Advertiser 2 July 1845.